Our haps & staples are ideal for locking a variety of interior doors and exterior doors, including shed doors, garage doors and gate doors. These locking mechanisms work by fitting a metal strap over a staple, which then would be secured by a padlock or a pin. At Ironmongery Experts we stock a wide variety of padlocks which you might require for your hasp & staple, such as heavy-duty padlocks, weatherproof padlocks, combination padlocks and key padlocks. Additionally, we supply a heavy-duty padlock combined with hasp & staple bundle to meet your safety and security requirements. If you are in the market for heavy-duty locking mechanisms, you can browse through our Sold Secure Range, in which we stock anti-picking steel padlocks, high security ground/wall anchor, harden alloy steel chains, Abus weatherproof padlocks and heavy-duty hasps and staples. For added security of garages, gates, storage containers, workshops and sheds, you should check out our large selection of security products. One of the main brands featured in this range is the British security brand, Bulldog Security, which offers high security doors locks suitable to secure most metal, glass fibre and wooden garage doors. Our wide range of outdoor hardware products continues with tee hinges for sale. This type of hinge will aid the process of opening and closing any gates or doors. Among our range, we store handcrafted tee hinges, black tee hinges, zinc tee hinges and more. We also have an assortment of heavy reversible hinges for sale. 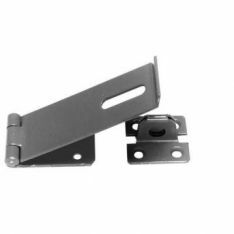 This range offers various sizes of strong and reliable hinges, including galvanised steel heavy reversible hinges and black heavy reversible hinges. Hook and band hinges are also available in our stock in a variety of sizes and materials. These type of hinges are used for hanging exterior doors and gates. Our stock includes adjustable hook and band hinges, cranked hook and band hinges and reversible hook and band hinges. A wide variety of gate hinges and fastenings for sale are also on offer. We stock various hinges and fastenings, for example, double strap bands, hinge sets which come complete with all the required fixings, screws and hooks, as well as equestrian stable cabin hooks. As an alternative to the latter products, we also store sprung hinges and coil gate springs, which can be adjusted both vertically or horizontally. We supply TruClose self-closing gate hinges, coil gate springs and decorative gate hinges. Additionally, we have a wide collection of modern and traditional gate latches currently in stock. One of our most popular products is the MagnaLatch model, which is easy to install in metal, wood or glass gates, has no visible fasteners and with its magnetic latching system this product prevents sticking or jamming. If you are looking for a more traditional looking latch, we stock high-quality ring gate latches, including handcrafted Shakespearean latches. Besides gate latches, we also stock gate bolts as another locking mechanism for gate doors or other exterior doors. Our range of gate bolts includes foot operated bolts, spring chain bolts, door drop bolts, bow handle spring bolts, padlock bolts, amongst others. Additionally, we supply galvanised hot bed handles that come in sizes 150mm or 180mm. In order to maintain garage doors in an upright position for you to enter and exit your garage safely, you’ll require garage door stays. At Ironmongery Experts, we have several door holders in stock, suitable to be fitted to the underside the lintel. Regarding equestrian ironmongery, we stock a comprehensive selection of equestrian products you might require, including tables hangers, saddle poles, saddle racks, saddle stands, bridle brackets, stable door latches and much more. In case you are looking to improve your property’s security by installing security cameras, look no further, we provide wireless monitoring sets that come equipped with two wireless weatherproof cameras, motion detection with alarm function, infrared night vision function and an app to have access to the video footage at any time.